Cards for the holidays are now available from ACCESS! Give the lasting gift of an education. Simply purchase a card, specify a donation amount, and present the card to your loved ones this holiday season. 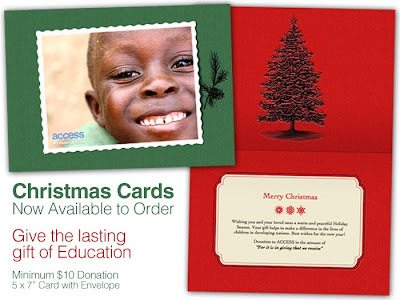 Purchases of these cards not only provide a gift for you to give, they also help to provide the gift of an education to youth in developing nations, bu supporting our Global Initiatives. To order yours, please email info@accesscharity.ca. Payments are accepted online here (please specify quantity of cards) or by cheque payable to "ACCESS: Allowing Children a Chance at Education, Inc." (Note: tax receipts are not available). Minimum donation of $10 per card. Shipping extra if required, pickup available. Thank you for your support!